Shell chief executive Erik van Beurden, one of the big players in the Australian gas industry, recently admitted that “social acceptance [for our industry] is just disappearing”, while Shell Australia’s chairman Andrew Smith last year urged the industry to be less hubristic and more willing to collaborate. Industrial developments have social consequences, particularly in the case of unconventional gas extraction. But my analysis of the social research done by gas firms in the Darling Downs – Queensland’s coal seam gas heartland – indicates a lack of rigorous research to identify community attitudes. I looked specifically at the “social impact assessments” carried out for Arrow Energy’s Surat Gas Project. I evaluated this assessment against the academic literature on best-practice methods and the results of my own anthropological fieldwork on coal seam gas developments in the Darling Downs, including interviews and participant-observations among a broad variety of residents. This included farmers with and without gas wells on their land, town residents, Indigenous people, activists, and those who viewed the industry favourably. In my experience, the industry’s social impact assessments do not generally meet the benchmark of good social anthropological research. They are largely completed using computer surveys, with limited amounts of direct local fieldwork and relatively little real attention paid to the particular issues raised by vulnerable groups or what actually matters to local communities. Social impact assessments should be participatory and take into account the unequal distribution of the impacts among local populations. Some people will feel the impacts more than others – this means that in-depth research in the region is required. A desktop analysis of census data, complemented with information obtained during a few “consultation” meetings, is unlikely to reveal the variety of impacts caused by industrial projects. The conclusion is that such studies, combined with a regulatory agenda that prioritises economics, have created problematic “silences in the boom”. In Australia, policies governing extractive industries such as onshore gas are mostly viewed in terms of economic cost and benefit – or to use the current mantra, jobs and growth. The projects themselves, meanwhile, are seen chiefly as a series of technical challenges to be overcome by scientists and engineers. Public concerns about the effect on quality of life or uncertainties about underground impacts are commonly dismissed as irrational, emotional or uninformed. But the main problem faced by onshore gas producers is not an engineering one. Social research has shown that the fundamental problems include lack of trust between gas producers and local communities, as well as differing views on livelihoods, culture and the environment. In the coal seam gas fields of the Darling Downs – a rural and agricultural area – the effects on the ground, including concerns about extraction techniques such as fracking really matter. While individual gas wells typically have a relatively small footprint of about one hectare, the cumulative regional footprint of numerous connected gas fields and associated infrastructure is considerable. The management of the impacts is negotiated in individual agreements with landholders as well as indigenous groups with traditional connections to country. Dealing with this social world is relatively new to many oil and gas companies that have previously focused mainly on offshore projects. 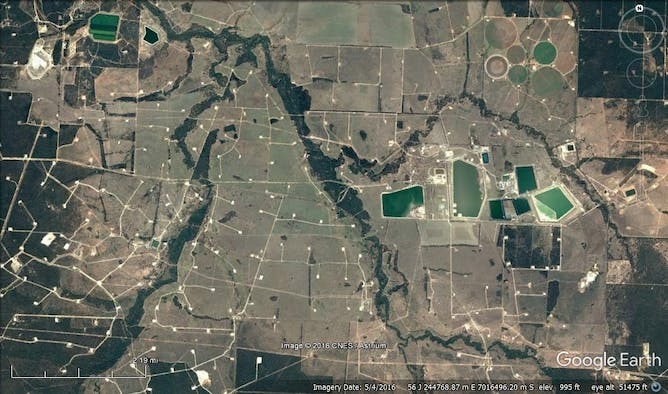 Satellite view of a coal seam gas field in Queensland. Google Earth, Author provided. Unconventional gas and fracking developments have led to demonstrations, blockades, and the rise of vocal anti-fracking groups both in Australia and around the world. Gas producers in Colorado, for example, seem to have been shocked and surprised at the level of protest against fracking, a technique they have used for decades. Instead of dismissing public concerns as irrational or ill-informed, politicians and gas producers could look carefully at why their proposals provoke these reactions. Just calling for more gas, more science, and less red tape is unlikely to diminish anti-fracking sentiment. Gas can be scary. It is everywhere and nowhere. You can’t feel it, see it, hear it or smell it unless you add something to it or measure it with an expensive device. Gas doesn’t have the same cultural symbolism as coal, the black gold of our settler history, or the Snowy Mountains, scene of the great “nation-building” hydroelectric project that Turnbull has pledged to make even bigger. Anti-fracking activists, meanwhile, have sought to imbue gas with a cultural symbolism that draws on the underground world of demons and danger. Footage of burning tapwater is a potent example of “matter out of place”. No matter that methane is sometimes found naturally in water. Cultural anxieties are rarely eased by natural science. So while the federal government and industry figures call on states and territories to ease restrictions on gas exploration, they should bear in mind that unconventional gas can provoke strong anxiety and opposition. The architects of Queensland’s coal seam gas boom were slow to recognise this. Energy is fundamental to our ways of life, and social support is crucial for the companies that provide this energy. Such support is not earned with desktop studies or by dismissing non-economic concerns. It is earned with genuine engagement and social policies that take seriously the experiences and diverse views of people now on fractured and uncertain ground.